Welcome to New Bethel Abundant Life Ministries! Our prayer is that God will empower, anoint and refresh you though His word! It is our goal to help and assist the world and serve as a shining light in our ever changing world! We hope that you would interact with our site and that you and your loved ones are blessed! 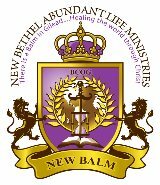 Remember that there IS a BALM in Gilead!! Marriage Ministry Lord, Make us one! Men's Ministry Men of Valor! !